Edgy, frenetic and lively we always visit Times Square when we’re in New York, the bright lights and electric action seem to draw us in like a magnet. We were there more than usual on this trip – Toys R Us with its ferris wheel, numerous candy stores and the Hop On/Off bus had us there during the hours of daylight. Definitely best by night though, the flashing billboards create an overwhelming spectacle and the theatres of Broadway are pulsating with life. Son loved it too – all those lights and all that action, you can’t help but get a buzz from it. As well as soak up the atmosphere we came here a couple of times for dinner. Touristy for sure, the restaurants can be a bit gimmicky but with a 4 year old in tow we didn’t mind one bit – fine food was not on our agenda. Our first port of call was Mars 2112 – an alien themed place which was such great fun – a spaceship ride to our table and numerous aliens mingling and wandering around while we ate got a massive thumbs up from Son. All to do with the atmosphere we had a great time, sadly I think it has since closed. A real Times Square tradition for us is Ellen’s Stardust Diner. Retro and 1950’s style it is nothing much to look at from the outside and serves very tasty but pretty standard burger type meals, Husband and I literally stumbled upon it on our first NYC jaunt. It has become a firm favourite, somewhere we revisit every time we are in the Big Apple. Nothing again to do with the food or the theming, it is all about the staff here. All Broadway wannabees they burst into song mid food service, entertaining customers with songs from the musicals, singing and delivering burgers all at the same time. Son was engrossed with the huge screen on one wall showing a Disney movie – no sound but that didn’t matter. 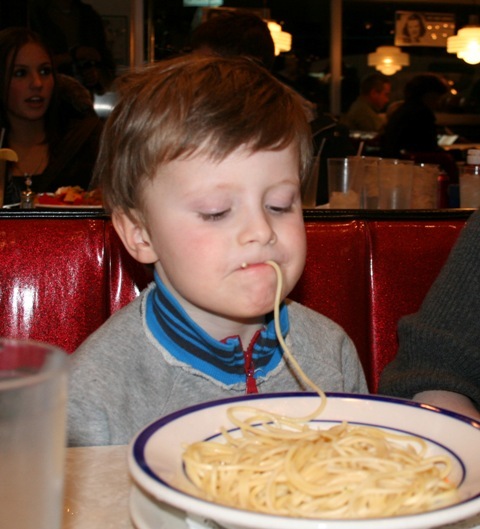 When he had a spare moment a plate of spaghetti kept him busy. We arrived around 6.30 in the evening and easily got a table although the restaurant was fairly busy. By the time we left at 8 pm there was a line outside the door stretching right around the block so it seems like we’re not the only ones who love it here. Kitsch and fun, this is one of our Times Square traditions worth continuing. Definitely an awesome tradition! 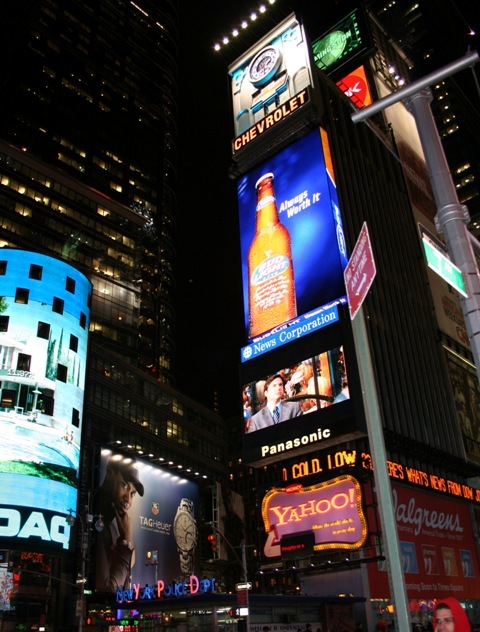 Times Square is no doubt a must in NY…. and its my favourite part of the city, its where I feel part of this World 😀 you just made me miss this city even more! Have a great weekend! I love the buzz and the atmosphere – such a great place in an amazing city! Hope you enjoy the weekend too!! Touristy as it may be, there is nothing quite like Times Square…the people watching and the atmosphere make it worth the crowds! Completely agree Amanda – it’s just amazing. Have a great weekend! It’s so full of life and atmosphere we loved it!! Can imagine your homesickness Jane – looking at the pictures I would love to be back now too! Thank you – it is such a great city, we love it there. What an attraction Time Square has become after going through a rather CD.. Did your son ride the Ferris wheel at toys R us? I remember when we first went to NYC and it was not such a great place. Totally transformed now though – we love it. We did all ride the ferris wheel – not surprisingly that went down very well!! A fairground ride through the middle of a huge toy shop – hard to top that!! Love how words get changed. CD is supposed to be seedy period! I think it probably is the same chain Rosemary. We have them all over the place here and I’m no fan of them at all. The Times Square shop is different though – the ferris wheel is just the icing on the cake. 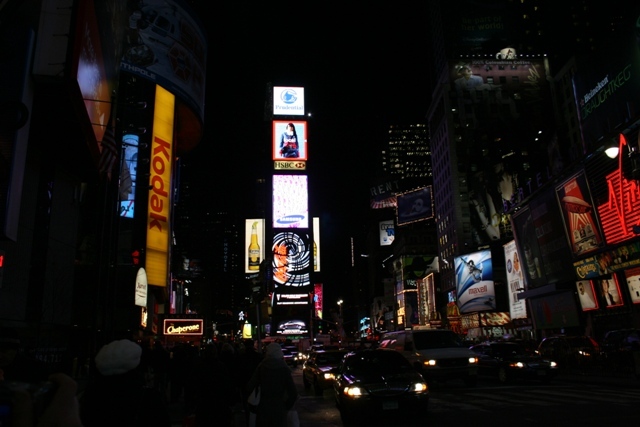 Times Square is just what you imagine it to be – buzzing, bright and full of life. Definitely somewhere to people watch too!! Hope you have a great weekend too! Oh how I remember those meltdown days!!! Ellen’s sounds so fun!!!! Great post! It is such a great place – really different and we’ve always had a great night there! Have a lovely weekend Diana. Ellen’s is famous and the Toys R Us is incredible! Glad you had a good time there. We loved both places – loved NYC really – I just can’t get enough of it! It’s such a great place and was such a great evening. The pasta went down very well too!! Are you trying to make me homesick? I’m really trying to make the “expat” thing work….just kidding – great post! Cheers! I can’t claim homesickness but do know what you mean!! Wow – that diner looks like our kind of place 🙂 We love NYC and have only been there once but just have been edgy to back since. Thanks for tempting us more! 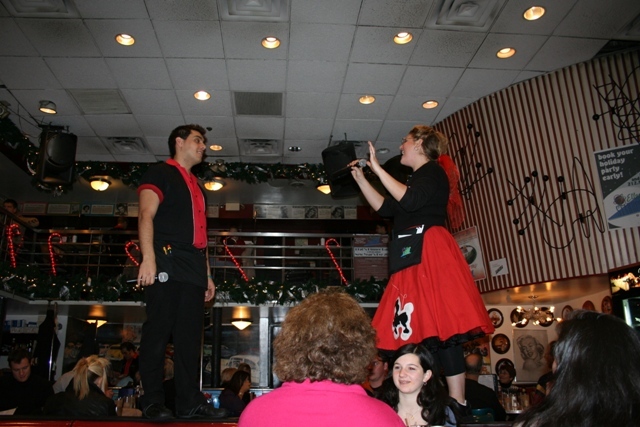 The diner is a great place for a fun meal out – hope you make it to the Big Apple soon! !